FitzFX scorecards provide a review of each MLB pitcher’s appearance along multiple dimensions with a focus on evaluating performance. Each MopUpDuty.com scorecard is provided for a single day of MLB activity and is broken down by game and pitcher, highlighting important metrics, visualizations and comparisons to facilitate the reader’s rapid review/analysis and change identification. The base data underlying the scorecards is based on the Pitch FX data provided through MLB.com. Some derived metrics are created by Neil FitzGerald (e.g. Movement index) while others are borrowed from other noted sources e.g. BaseballHQ.com’s xERA metric. The scorecards featured at MopUpDuty.com are broken down by calendar day. The scorecard with the latest full day of MLB action is displayed on the main page (as seen below) with links to previous day’s scorecards listed at the bottom of the page. may need to expand this yourself by clicking on the “Expand Sidebar” button. The pitchers are sorted by game and then by order of appearance in that game. You can navigate the entire scorecard online at MopUpDuty.com. Alternatively, if you would like to download the entire day’s set of pitching performances for later review on your own computer, you can click on the Download/save icon icon. You are free to reference and share any of the scorecards but please provide credit to Neil FitzGerald where shared and do not edit the PDF files . The top left of the scorecard provides a breakdown of the pitcher’s pitch selection in that performance and contrasts it with the historical pitch selection breakdown for the same pitcher from the 2013 season. Where no pitches were recorded by PitchFX in 2013, the right most pie chart will be absent. This visual provides a quick method for identifying a change in pitching emphasis amongst a pitcher’s arsenal of pitch types. For example, the image above highlights that Scott Feldman threw significantly more change-ups and fewer sinkers in this start compared to his 2013 averages. It’s worth noting that the PitchFX classification system may change over time so this could always be a possible explanation of an apparent change between two pitches that are similar. The top right of the scorecard reflects the location of all pitches [as they cross the front of home plate] for the selected pitcher in the given game. The pitch location grids are separated for left-handed and right-handed batters to highlight the pitcher’s potentially varied focus on each. A color-coded legend is provided to help identify the pitches. These two scatter plots are meant to facilitate the reader’s analysis of the pitcher’s different pitching strategy versus right-handed and left-handed batters i.e. which pitches does he throw to whom. 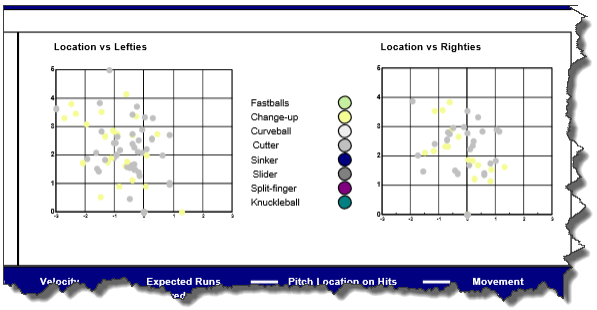 These visuals also highlight the variability [in end location] at which each pitch is thrown. This variability can be both a good and bad thing dependent on pitcher intent and control. The pitch specific elements of the scorecard below helped provide more a detailed perspective on whether the variability of location per pitch was effective generating outs or strikes. The bottom left side of each scorecard breaks down a pitcher’s performance by pitch type. For each type of pitch thrown e.g. Change-up, a variety of summarized metrics are provided. In addition to count of each pitch thrown, the percentage of all pitches is reflected again here along with the average velocity for that pitch type. To the right of pitch speed, a grid is presented highlighting the pitcher’s ability to throw that pitch for strikes (or balls) and a breakdown of at-bat outcomes. Each of these summary metrics is contrasted with the pitcher’s historical performance (limited to 2013 in this case) to enable a quick review of changes in approach or effectiveness. 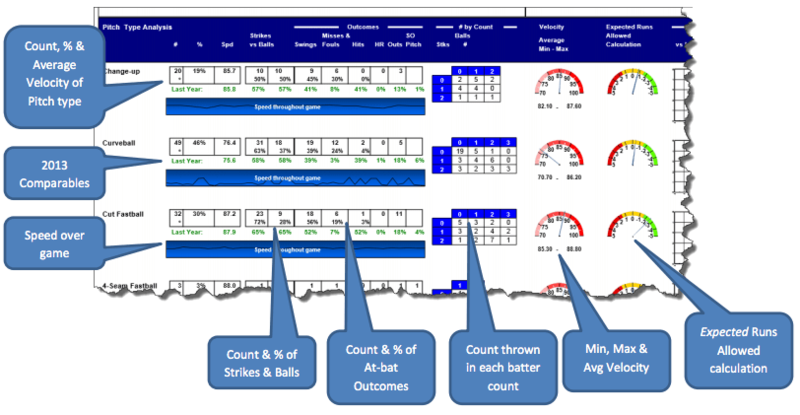 Below the summary grids is a review of pitch type speed over the course of the involved game. To the right of the summary grids, a cross-tab and two gauges are presented. The cross-tab summarizes the number of pitches [for that pitch type] thrown in each count. The velocity gauge presents a visual of average speed with the summary numbers below highlighting the velocity range of that pitch type. Lastly, the “Expected Runs Allowed” calculation is derived from the at-bat outcomes for each pitch. While it will not reflect actual runs scored, it uses the historical context and value for each outcome to score the pitch type on how many runs would have been expected with those outcomes. This metric is a nice way to review a performance outside of the actual game and run results bias. The bottom right of the scorecard highlights pitch location on actual hits [for each pitch type] and a derived movement index calculated based on average pitch type movement. By reviewing the location of hits on specific pitch types, readers can begin to analyze pitcher intent and control. 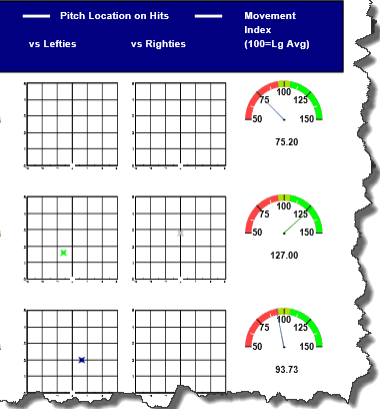 Contrasting the location of pitch types where hits occurred versus the primary pitch location charts enables a preliminary assessment on whether hits occurred on good pitches or mistakes. Lastly, the movement index is a derived metric by pitch type that is meant to grade each pitcher’s different pitches [based on total movement] in contrast to a league average of 100. A score of over 100 here suggests that that pitcher’s movement for that pitch type is better than MLB average. Monitoring this score over games will help assess consistency in movement and potential for changes in effectiveness. At the bottom of every pitcher scorecard, a game summary is provided for the involved pitcher. A variety of game summary stats are provided included innings pitched, number of At bats, number of pitches thrown, strikeouts, walks, hits, home runs, outs and three calculations – K/9, KK/BB and Expected ERA (xERA). The calculated K/9 and KK/BB metrics are color-coded based on a scorecard rating system. Red suggests a very poor pitching performance, yellow suggests a mediocre outing and green suggests a positive game for the pitcher. The last metric is based on BaseballHQ.com’s definition of Expected ERA based on the pitching events in the game. It is a good metric to consider outside of any one game’s actual run and win/loss result. Neil FitzGerald has been involved in roto/fantasy sports for over 20 years and has played many roles including running an early stats service, writing for BaseballHQ.com, The Baseball Forecaster and USA Today … and winning the first year of the FanGraphs experts league in 2011. He is an award-winning entrepreneur who has been working in the analytics/reporting software space for almost 20 years now and is currently trying to revolutionize online pricing in entertainment/sports with PriceWhispers.com. A technology author with almost 50,000 books sold to date in multiple languages, he has a BSC in Computer Science from Queen’s University and an MBA from Ivey at Western Ontario, both in Canada. After many years in NYC, Neil currently resides back at home in Toronto.